Some sects use kalpa bheda or manvantara bheda to explain contradictions in the events narrated differently in different puranas and when there exists no way to reconcile them. Does such explanation have any scriptural basis? Due to the difference of Kalpas, the story of the birth of GaneSa is told in different ways. According to one account he is born of the great lord. His head looked at by Sani was cut off and an elephant’s head was put on him. Now we narrate the story of the birth of GaneSa in Svetakalpa when his head was cut off by the merciful Siva. Lord Råma has bodied Himself forth in diverse ways and that the Råmåyana, though consisting of a thousand million verses, is yet infinite. Great sages have diversely sung the charming stories of Lord Hari, relating as they do to different Kalpas or cycles. What does the expression "kalpa bheda" mean? We find another reference apart from what is already quoted by user YDS. In Skanda Purana, Vaishnava Khanda, Vaisakhamasa mahatmya(section 7), 13th Chapter. from verse 69. This talks about differences because of different yugas and kalpas. 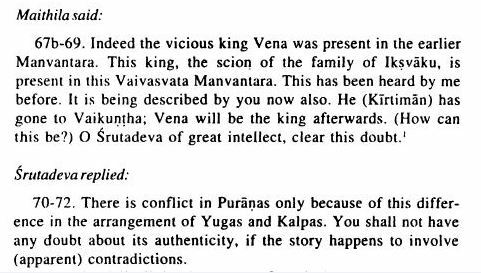 Padma Purana, Patala Khanda, Chapter 116 describes Ramayana of a former Kalpa. 9- 13 . Seeing the king comfortably seated, that brahmana Sambhu then said proper words : "0 best king, you, honoured by all, remain here. What is the thing in your heart i.e. what is your desire ?" The descendant of Raghu, having heard the brahmana's words, desired to hear a story. His clever words were just then heard by all. "I desire to hear a wonderful tale referring to me or telling about the destruction of the demons ." Then the king said this : "The murder of Kumbhakarna took place first and Ravana was killed afterwards. Who is this best brahmana who, causing ungodliness (to spread) among all the people, narrates it in a different way after having gone to the king's place ? Should he be punished or honoured by me?" Then Jambavat spoke to this best of the Raghus about the story .. "This is not your Ramayana (i.e. not your account as told by Valmiki). This is recognised as prepared (by someone else) . 0 lord, now I shall tell it in detail. Listen to it. It was formerly heard by me from the son of the lotus-born (Brahma) .' ' Requesting Jambavat, Ramacandra said (these) words : Sri Rama said : 14- 1 8 . Narrate that tale of the past. I have curiosity to listen to it. Who propounded it and who knew it?